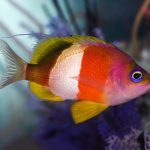 Sacura sanguinea is a newly described species of anthias with some of the most vibrant colors and dramatic patterning ever seen in a reef fish. The name comes from the Latin word for “blood-red”, in reference to the thick stripe found in males which gradates from yellow to red. 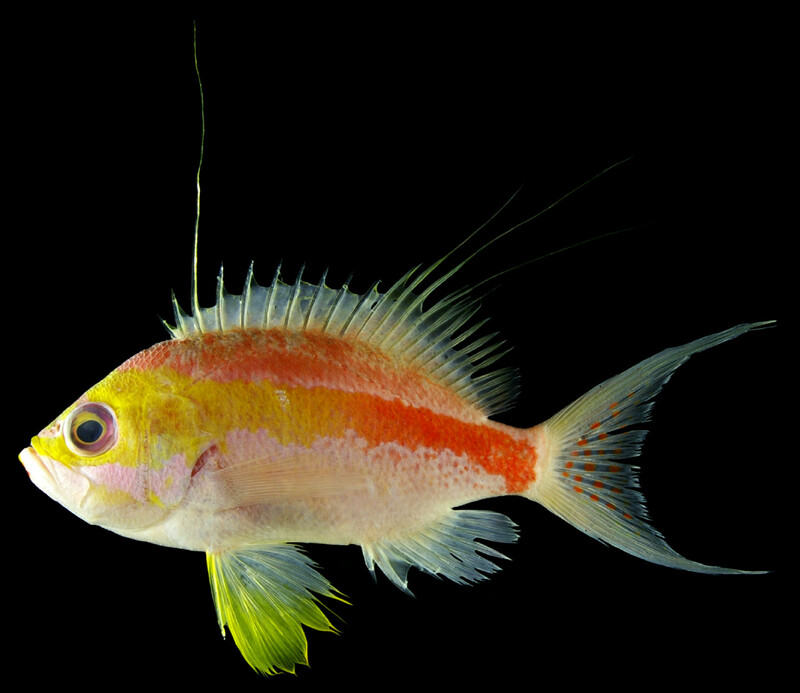 In addition, this “bloody anthias” has a pink back, yellow pelvic fins, and a series of red polka dots in its tail. But it feels as though words simply fail to do justice to the jawdropping beauty of this fish. And the females are no less stunning, sharing most of these traits, but with the addition of a large red blotch in the dorsal fin. However, aside from its dashing good looks, there is virtually nothing else that we know about this new species. 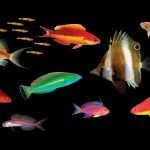 A trio of specimens was found at a fish market in Thailand, having been trawled up from an unknown depth in the Andaman Sea. 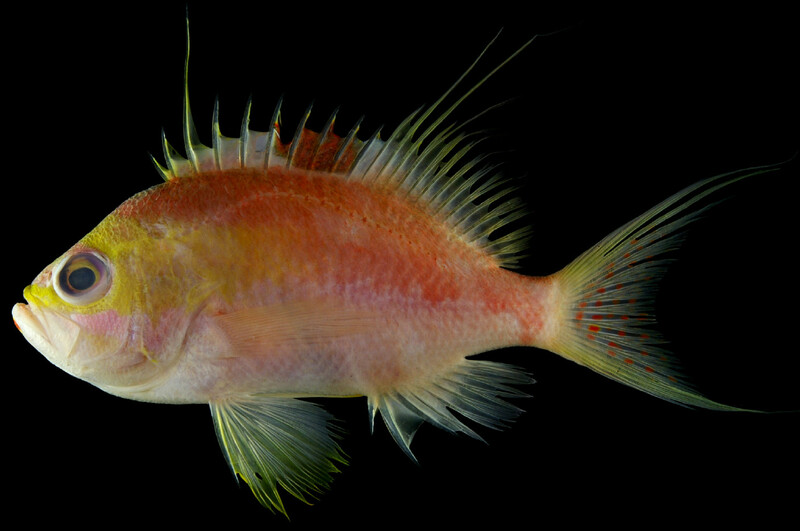 We can safely assume that this is a fish restricted to mesophotic reefs in the region, as the four other members of this genus occur only in deeper waters. In appearance, it seems to most closely resemble S. margaritacea from Japan and S. parva from the West Pacific, both of which have females possessing a similar spot in the dorsal fin. 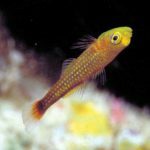 Females of the other two species, S. speciosa (Indonesia, Philippines) and S. boulengeri (Oman, Pakistan), are unknown, but males of these appear considerably different in their patternation. 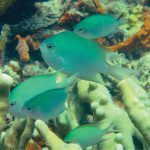 To date, the mesophotic reefs of the Andaman Sea remain poorly explored, which likely means that we can expect many more exciting discoveries from this region in the future. 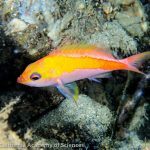 For instance, odds are quite good that there is still a fairy wrasse waiting to be found here, and who knows what else might be lurking in this remote corner of the world. Reefs.com / Afishionado MACNA Show Awards!